SG-1 returns from the planet Oannes without Daniel Jackson, who was last seen being consumed by flames. But as his teammates mourn his passing, they struggle with the inexplicable feeling that Daniel isn't really dead. In fact, Daniel is still alive on the planet, captured by Nem, an amphibious creature who hopes that Daniel's memories will be the key to finding his lost mate, Omoroca, who had lived on Earth in ancient Babylon. As Daniel strains to remember his history, SG-1 fights to overcome their falsely implanted memories and to find a way to rescue Daniel. Daniel Jackson, presumed dead, was granted a memorial service with full military honors. Oannes possess the technology to alter or implant memories. Nem used ancient Akkadian cuneiform writing to communicate. 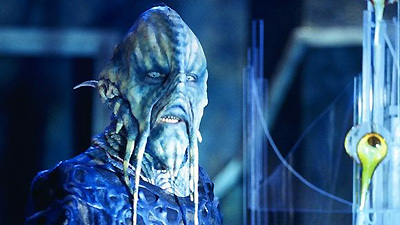 Omoroca, the lost mate of Nem, had come to Babylon on Earth 4000 years ago to fight the Goa'uld, and was killed by Belus, a Goa'uld conqueror. The history of Belus was recorded by Berossus, a contemporary of Alexander the Great: "And in that place there was Omoroca, a woman who came forth from the heavenly egg, who walked among men by day, but at night, she would retreat to the Great Sea to sleep, one of the beings called Oannes. The God Belus came down unto Babylon, unto the place of Omoroca, and he cut the woman asunder."